Hina Khan, small-screens biggest star has been making waves inside the Big Boss House. The Yeh Rishta Kya Kehlata Hai actor who’s been scoring full points in the sartorial department, thanks to her stylist Hemlata Periwal, is once again in the news cause of a certain designer Neerushaa Nikhat exposing the secret behind Hina’s wardrobe. Television's favorite bahu has been nothing but a sartorial treat to our sore eyes, cause of her on-point styling. Hina and Hemlata aka Hemu have however been creating headlines cause of accusations made by designer Neerushka. 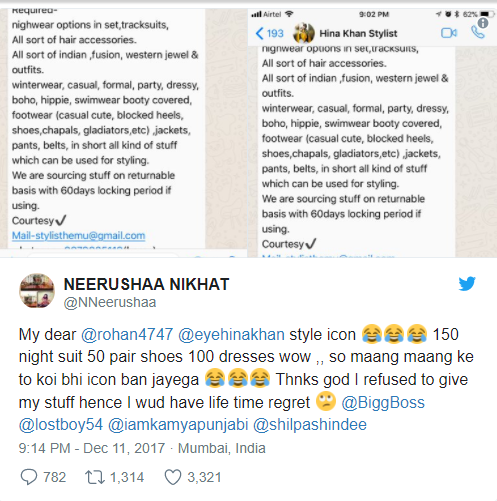 Neerushka has accused Hina Khan of wearing ‘borrowed’ clothes and has slammed the actress and her stylist by sharing WhatsApp screenshots between Hemu and her. The entire story began when Rohan Mehra complimented Hina for being India’s new style icon. The designer slammed the actress in a series of tweets. We can all agree that seeing our A-lister sashay down the red-carpet in breathtaking gowns which are borrowed from designers for a day, is quite a common sight. 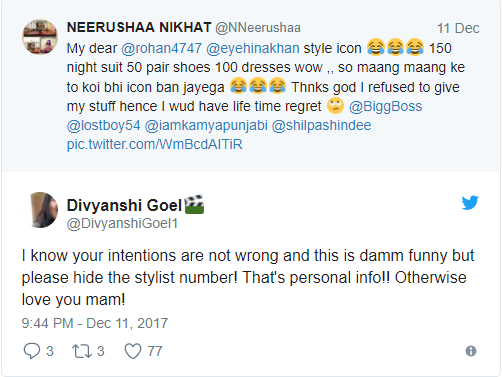 We wonder how Hina would react to this sartorial controversy after coming out of the show!